LocalCircles announces investment from Anand Mahindra and his appointment on advisory board. New Delhi, India, December 10, 2015 – LocalCircles (www.localcircles.com), India’s leading Citizen Engagement platform today announced that Mahindra Group Chairman Anand Mahindra has made an investment in the company and will be joining company’s Advisory Board. 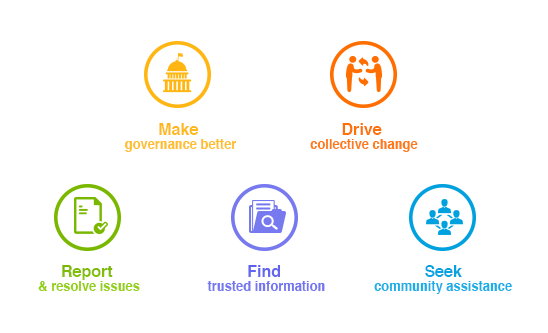 Launched in 2013, LocalCircles is now India’s largest online citizen engagement platform that enables citizens to connect with causes that they care about ranging from Civic Issues, Finding Emergency Assistance, Law & Order, Local and National Governance, etc. It enables citizens to easily come together to assist each other, share information, find resolution, connect with the administration, participate in national/local governance and improve their urban daily lives. The LocalCircles 1 year Swachh Bharat poll with 335,000 strong citizens across 200 cities highlighting to the Government what’s working and what needs immediate attention to make Swachh Bharat delivery more effective. “LocalCircles has built a community and a network across the country in an admirably short span of time. I am making this investment because this is what is termed a 'shared value' project, where you can do well and do good at the same time. I think LocalCircles has the potential for make things better for average citizens, by empowering them to help themselves and that is an extremely exciting prospect, said Anand Mahindra. “Anand Mahindra’s understanding of social challenges in India will be a great asset for LocalCircles in achieving its potential to do good”, said Sachin Taparia, Chairman and CEO of LocalCircles. “LocalCircles is like the Whatsapp or Facebook of causes where Facebook/Whatsapp are generally used to connect with people we know, LocalCircles enables one to connect with people they don’t know but care about the same cause – better neighborhood, fighting corruption, making city cleaner/safer or assisting with emergency/blood”, continued Taparia. LocalCircles has communities in 200 cities of India already will use the proceeds to make the network available to many more citizens and many more causes across India. The company is in discussions with several other social impact investors for the next round of fund raise, estimated at 20 Crores. LocalCircles represents Social Media 2.0 which is focused on solving real world problems by bringing people together. LocalCircles founding team comprises of Sachin Taparia former Managing Director at Boeing Internaitonal, K Yatish Rajawat, Former Group Managing Editor of Dainik Bhaskar group, Mukesh Gupta Former executive of Juniper Networks and Abhishek Gupta formerly of Oracle Inc. Mahindra will join Nadir Godrej, Managing Director of Godrej Industries who had invested an undisclosed sum in LocalCircles in early 2013 at concept stage and Maruti Chairman RC Bhargava on the LocalCircles advisory board.